So far Michael Waltenberger has created 7 blog entries. The project partners AVL and General Motors presented ADVICE at the international conference AVL Engine and Environment 2018 in Graz. 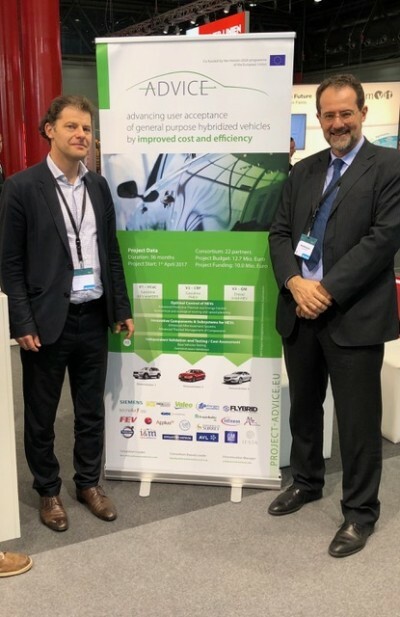 Siemens, a project partner of ADVICE, submitted a conference paper at SAE Torino in June 2018. AVL and General Motors gave a project presentation at the JSAE Annual Congress in Yokohama, Japan. Representatives of AVL and GM presented ADVICE at the International Vienna Motor Symposium. Project members of AVL, FEV, IESTA and VIF presented ADVICE at the TRA in Vienna. Dr. Michael Noest, IESTA, and Maurizio Maggiore, Policy Officer and Senior Export of the European Commission exchanged their views on the project (see photo). The ADVICE consortium came together for the F2F Meeting (General Assembly) in Turin, to discuss the current status and the future challenges of the project. Hosted by General Motors, the meeting focused on the status of the main 6 work packages and the upcoming challenges.